CÜR Music launches US rival to Spotify and Pandora | What Hi-Fi? The three biggest recorded music companies, Universal Music Group, Sony Music Entertainment and Warner Music Group have licensed the new service, which has just launched in the USA. The new service has been described as a hybrid between an on-demand service, similar to Spotify and Apple Music, and an internet radio service like Pandora. The big three companies have signed licensing deals with the service, which claims to have a library of around 10 million songs. All the deals are “limited non-exclusive digital distribution deals”, and Sony and Warner will receive guaranteed advances. This hybrid approach will give more attention to the radio side, with users being able to listen to custom stations and curated playlists. With the on-demand service, users will be able to listen to a maximum of eight tracks a day, which can be swapped out daily. The service will also have social media functions, letting users chat and share music with friends, as well as attaching messages or videos. 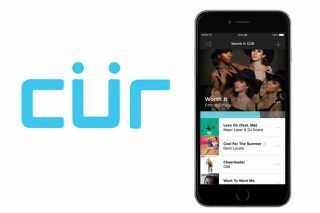 CÜR says membership will start at $1.99 per month for an ad-free subscription, although various media outlets claim it will have two tiers: “Octo” costing $2.99 a month and “Inked” costing $6.99 a month. The latter will allow for offline listening. The service’s website says it’s coming soon in the US, and anyone interested can register their email address to be given updates. We’ve asked CÜR if it plans to launch the service in the UK, and will keep you updated with any news.